How Much Does Co-working Cost in the UK? Co-working is a great work space option for those looking to take the first step out of their home run business into a more focused and productive environment. Co-working is also a great space to study for students as libraries become more crammed, workers who travel a lot and work in isolation or independents who are just looking for a couple of days a week away from daily operations to focus on heavy admin or writing tasks. You choose how it will benefit you. Co-working costs vary depending on numerous factors. 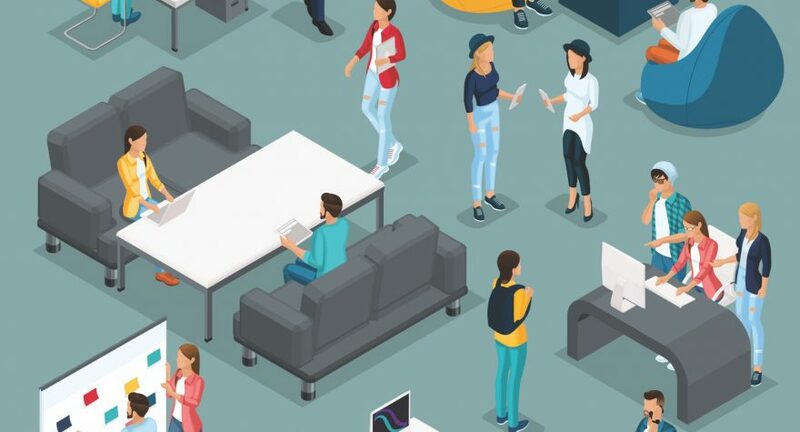 In this blog, we will cover the factors that determine the cost of Co-working space, the average price ranges within the industry, how much a co-working space is at Liberty Space and what factors we take into consideration to ensure you get the most from your space. Co-working prices can vary depending on location, services, add-ons, quality, time and values. These tend to be the main variables across the industry and differ from country to country, location to location. Location drives prices mainly due to property prices. It’s like paying for a house in different locations. In a small town for £100,000 you could get a 3-bedroom decent house or for the same price one bedroom in London… and you only get the bedroom! So, a property owner can pay up to four times more for a property in a city compared to a town so their prices have to reflect that. Everything is more expensive in a city due to local economies, logistics, amenities, demand. Different co-working spaces offer different services that are included in their prices. These can include reception to greet visitors, support staff to handle issues. Tea and coffee on demand. Use of facilities such as kitchens. Things to keep your day going with as little disruption as possible. Different spaces are going to suit your style, needs or price range and different prices are going to give you a spectrum of quality. A Wework in a prime location in Edinburgh will not only be very modern and smart but also on the higher end of the price scale. On the other end of the price scale you can get the basics of a room with decent tables and chairs but can still give the same community on a smaller, local scale. From a business perspective, if you have limited funds you can start off small and work your way up, building your network on the way. Make sure you can afford it and don’t strain your funds. Many co-working companies tend to offer different solutions to the time spent using the space that suits you. Whether it be 24/7 to suit your flexibility, 9 till 5 to fit round the kids or pay as you go if you travel a lot. You may even be offered a set number of hours in your membership price to use when you please. Some co-working companies may even let you use different co-work locations within your membership. There are plenty options to suit your needs. As you know in the business world, there will be companies out there only focusing on their numbers; revenue, capacity, churn. You might find the customer service difficult in a company like this. You can also find other co-working companies that are completely about the customer experience and the community to ensure you get as much value from the space as possible. These types of companies realise the real value of co-working space to their customers. Add-ons will increase the price of your membership which can include a mailing address, call answering, locker space, a private desk, printing and copying. These items tend to be standard across the whole industry as an extra cost, with varying prices. If there is one thing that is standard across the industry is that you can’t get a straight answer price for co-working. They will most likely tell you the price from then the more add-ons you want the bigger the price increase. A bit like easy-jet! We conducted a small experiment with a selected few known co-working spaces to see how easy it was to get a price without having to call the companies beforehand. I had to enter my details to get the prices sent to me. I was sent a PDF covering many factors such as types of memberships, what is included, options around the world, and co-working from £8.30. It was not clear if it was per hour, per day, per month. To get a clearer idea a phone call would have to be made. Wework gave prices for hot desks starting at £238 per month in London. Hot desks are booking a desk when needed compared to dedicated desk where this desk is yours at all times. This method of co-working is understandable in such a popular co-working space. Other co-working may allow you to use whatever desk is free when using the space. The Melting Pot is offering a fixed desk with some great services added on at £250 per month excluding VAT. They also offer different hot desk memberships with a set number of hours starting at £57.50 per month for 25 hours access. The Distillery are straight to the point with their pricing and what is included in the price with a fixed desk from £175 per month and Hot Desk from £100 per month. We can review prices all day, but what is clear is the industry needs to be a bit clearer with their pricing so the buyer can make a fair decision without going through a dreaded long sales process when time is limited. To make a step towards being clearer on pricing. We have decided to let you know what we, at Liberty Space, charge for Co-working and what these prices include. Liberty Space is extremely passionate about the start-up and entrepreneurial community and we want to support people on their business journey. We try to base our prices on what start-ups can afford to give them a boost in their journey whilst also providing value through local communities, networks and start-up advice. We also provide flexible office spaces so as your business grows we will tailor to your needs. Access to the co-work space Monday to Friday, 09.00am to 17.00pm. Wi-Fi, Tea and coffee and access to kitchen facilities are available. Access to the co-working space 24/7 which includes access to other Liberty Space locations in Dalgety Bay, Kinross, Rosyth and Dundee. Wi-Fi, coffee and tea and kitchen facilities. Ownership to your own desk 27/7 in a set Liberty Space Location. Access to Wi-Fi, coffee and tea and kitchen facilities. Access to co-working space from 09.00 – 17.00. Access to WI-FI, Coffee and Tea, and kitchen facilities. Our contracts are three months minimum and are renewed automatically after your three-month period. If you would like to terminate your contract during this period, Liberty Space require a month’s notice before termination of contract. If you are not in the Fife Area but co-working is of interest to you, check out what your local area has to offer, what would suit your needs best and make sure you can afford it and take care of your cash flow. If Liberty Space is of interest to you, you can enquire here and we can get you in to check out our place and give it a go for the day for free to get a feeling for co-working. Co-working has enormous potential to help take your business to the next level, why not try out something new this week.